I’ve traveled a bit during my ever so short life time, not extensively, and mostly in the US. I must say, no matter where I go, or where I’ve been, the one and only place where sunsets, and sunrises – when I’m up long enough to see them, are consistently spectacular, is in the Valley of the Sun – Phoenix, Arizona, aw heck, all of Arizona has great sunsets… and sunrises. That is the single thing I’ve missed when not living in the 2000+ degree summers. I guess everywhere must have its redeeming factor, for Arizona it is definitely while the sun is hovering just below the horizon, throwing multihued rays to the sky. Even when there are no clouds to bounce off the colors, the sky itself throws them around creating a fantabulous show. I gaze upward and wonder how anyone could stare into the beauty and not feel gratitude for this amazing gift. 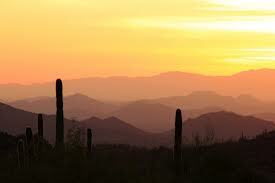 For the multitude, Arizona is not construed of desert alone. Oh no, no, no; we have mountains and snow, lakes and canyons, hills and plains. Save for the ocean which is just a few short hours away, we have almost everything. This entry was tagged Arizona, sunrise, sunset, Valley of the Sun.